This small shrub is fast growing, very drought tolerant and attractive. 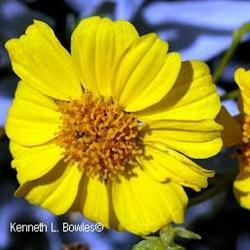 Its golden yellow flowers contrast beautifully with the 3” long silvery, wooly leaves. This plant is easy to grow and versatile. It looks good in mass plantings on slopes and hillsides,, or mixed in with other desert plants. Even though the flowers provide welcome color it beloved for its attractive silvery white foliage. This shrub is drought deciduous, but foliage life can be extended with a little careful supplemental watering. Just be careful to provide good drainage and not excessive water or you will shorten the life of this plant.